Rapid advances in science and technology are increasingly improving mobility among the elderly – a population that is growing at a faster rate than the entire population as a whole, according to the United Nations. The number of people above the age of 60 years is expected to more than double by 2050. As life expectancy at birth grows, the world will see hundreds of millions of people losing mobility in the next decades. From assistive seating devices that manually lift the person into a standing position without stress on their body, specialized poles that offer lateral stability to handles that make it safer for individuals to get out of bed, the options to help the elderly today are endless. For several years now, another cutting-edge technology has been widely discussed as the next big innovation for the elderly: exoskeletons. Exoskeletons are either external devices or power suits that use mechanical muscles to help users carry out regular activities like walking, sitting or standing. Though several companies have developed these devices, there has been some news about developing lightweight powered clothing into the market in the near future. Seismic, based in Menlo Park, Calif., is at the forefront of combining clothing and robotics. It is currently on schedule to be the first company in the US to release consumer-scale clothing with integrated electromechanical muscles. Essentially, the product will have electric motors that augment movements that the wearer typically wouldn’t be able to carry out unassisted. While the company hasn’t declared a narrow target audience for their invention, this type of clothing may be broadly used by people with mobility issues. A spin-off from the non-profit research institution, SRI International, Seismic said it will enter the commercial market with the limited release of their “powered clothing” by the end of 2018. The suits are designed to support the body’s core by providing up to 30 watts of power to each hip and the lower back to help with sitting, standing, lifting, carrying, and a range of other activities. The clothing will not assist with balance. The base layer includes apparel made with woven fabric and stretch knit that consists of pockets to hold the hardware and strength layer. The second layer is worn on the lower back and consists of an onboard computer with memory that gathers data from the sensors, wireless connectivity, and programmable suit controls. While terms like hardware and external pack may make the suit sound bulky, in reality, each muscle pack weighs one kilogram (kg), and the total suit weighs approximately 2.5 kg. This marriage between electromechanical science and apparel has sensors that track how a body moves and how the suit is assisting you. The idea behind this technology is to create a codependent relationship between the clothing and the individual. Although Seismic did not reveal the price point for its products, a company spokesperson said they will be in the high fashion label price range. Renowned companies like Honda and Samsung are also developing devices that assist with walking. Honda’s product consists of a trendy frame and battery-powered compact motors designed to assist people with reduced walking ability due to injury, illness or other causes. It specifically aims to improve the symmetry of the timing of each leg lifting and moving forward. Though still in the research phase in the U.S., the company began lease sales of the device – at approximately $400 a month for a 36-month lease period across Japan and currently being used at approximately 250 facilities within the country to assist training of walking and measure walking capability. The company, which started its research and development efforts for this product in 1999, has been given the green light to commercialize the device within the European Union. Japanese company Cyberdyne recently introduced a new hybrid assistive limb (HAL) product – HAL Lumbar Type for Well-being specifically designed for care receivers, such as the elderly. The idea of this technology is to improve the wearer’s function of the body trunk and lower limb through simple exercises. HAL is the first cyborg-type robot, which can help improve, support and enhance an individual’s bodily functions. A spokesperson from the company said although it is not fully verified yet, the improvement seems to last even after the wearer takes off the device. Currently, 57 units of HAL Lumbar Type for Well-being are operating in Japan, where it is available at the moment. The product has not been launched in mainstream markets yet and is only being used with partners the company works with so they can identify and solve problems related to the device one by one. Cyberdyne rents the product for between $600-900 per month depending on the number of units rented. While we are seeing more progress being made in the general class of exoskeletons, we are still far from seeing sleek, powered suits that assist with balance for the senior market. Researchers like Luis Sentis, an associate professor in the department of aerospace engineering at the University of Texas, Austin, think we are still a decade or so away from seeing such products in the marketplace. “I think simple smart orthotic devices (artificial support or brace for the limbs or spine) will enter the market within the next five years while mainstreamed lower-body exoskeletons for the elderly will take another decade and a half to allow the technology and the pricing to improve,” said Sentis, who specializes in exoskeletons for worker augmentation. Sentis highlighted several reasons that explain why we haven’t seen such power suits targeting the elderly available yet: one prominent reason? The risk of liability. He pointed out that companies could be scared to develop a product promising to help with balance and mobility given the elderly are more likely to die than the younger population. The chances of getting sued are much higher than if they were to enter the market with exoskeletons for workers. He also emphasized that the advances in this area could be limited because of limited funding. Another researcher, George Sawicki, associate professor in the school of biological sciences at Georgia Institute of Technology, identified two additional hurdles to powered clothing: the overall weight of the exoskeletons and comfort factors. “Soft exo-suits are approaching this level of form, fit and function, but so far still require motors to input energy and assist the user,” said Sawicki. 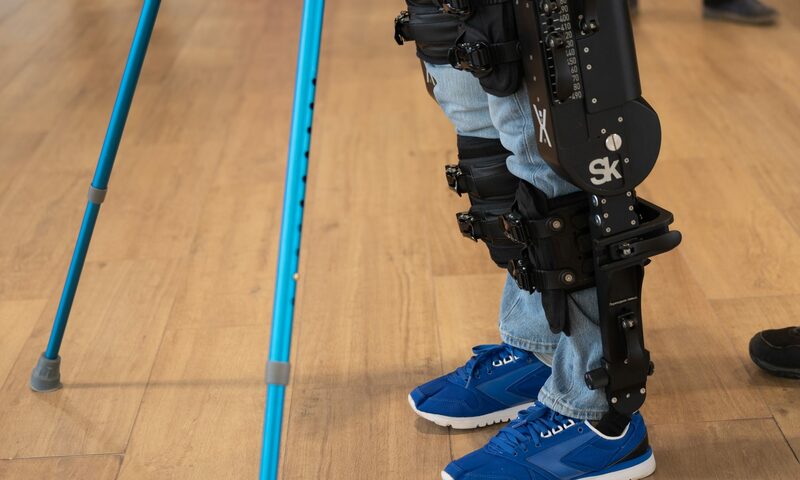 As products surface on the market, many researchers are investigating if these exoskeletons have the potential to restore walking capacity by reducing the energy spent on the activity. A study published last year by a Belgian group at Ghent University inquired whether exoskeletons have an impact on plantarflexion – movement of the foot in which the foot or toes move in the downward direction toward the sole – during push-off on the metabolic energy due to walking in physically active and healthy individuals. Researchers studied seven elderly people who walked on the treadmill with the exoskeleton powered on and powered off. The result? Those who walked with the exoskeleton powered on were able to reduce their energy by 12 percent, while those who had worn it powered off reduced 4 percent energy. The study concluded that walking with the exoskeleton was perceived less fatiguing for the muscles compared to normal walking. However, they called for more research that focuses on further optimizing exoskeleton assistance for specific populations. Exoskeletons should allow people to walk longer or faster than without assistance and could result in an increase in physical activity and resulting health benefits, the study said.